Technically, RTWC lacked polish. In terms of presentation, little more than half of the international teams that go through the qualification process were included in the game. That game was not a World Cup game. So EA put together a new development team that focused on that missing polish and presentation, and EA Canada is putting together a World Cup title that it can finally be proud of. The World Cup is truly a global event, and EA has come closer to capturing the patriotism and die-hard atmosphere of the cup than previous Cup titles. The soundtrack features 35 international tracks -- just pick your language. Rowdy fans wave giant flags. Confetti and streamers rain down on to the pitch. EA managed to include each of the German stadiums that will host matches, and each one pulses with energy and the atmosphere of the Cup. Players celebrate and despair with real emotion. As you move through the field of 16, the quarters, the semis and the finals, it only gets crazier. On the field, EA managed to slightly improve the product that RTWC put on the pitch. 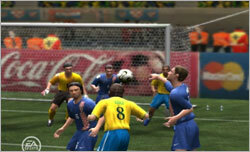 The game is notably faster than its predecessor and moves closer to the Winning Eleven style of gameplay in which you never see the same goal twice, unless you play on the default difficulty level which allows you carve though the defense like a knife through warm butter. The through-ball is definitely your strongest weapon against a weak defense. EA also upped the attributes of star players so you can actually see a tangible level of dominance over lesser players. Michael Owen is fast; you won't catch him. Ronoldihno can dribble; you won't steal the ball. David Beckham can pass; he will find the open man. As such, you learn quickly to get the ball to your studs, denoted by a red star when you control them on the pitch. A new shooting mechanic sounds a lot different on paper, but it feels intuitive when you get a controller in your hand. By holding down the shoot button, you increase the height of your trajectory, not the power of the shot. The power is decided by player attributes and body position, another aspect that ties in with finding your star strikers. If you tap the shoot button with Del Piero, you'll hit a blazing ground shot. If you do so with a clumsy fullback, you'll get a clumsy, awkward shot. Off the pitch is where you will see not only dramatic improvement over the inferior RTWC, but improvement over World Cup titles in general. EA adds a level of depth never before seen in these Cup titles that are released every four years. You can take control of 127 national teams and guide them through the qualification process, or you could start with the final selection of 32 teams and jump right into round-robin play. Then there's the Global Challenge, 40 historic moments in Cup history, from qualifying matches to the finals. You'll control today's players and recreate awesome scenarios or go against history and make an impossible comeback. Then EA paid homage to the host country Germany with a series of videos that show every stadium as well as the landmarks and people of Berlin. Then you have a passport in which you get a stamp for every country you beat. 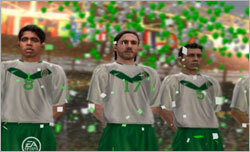 Then you have unlockable kits gear and historic players. There is a lot to do, more than in any other World Cup game in the past, and it's about time.